What are our strength, as a company, as a division, as an office, across our 12 important categories of engagement? Which teams best embody these strengths and can tell us about their best practices? Which employee segments are doing well? And looking beyond the engagement scores, why? Which employee segments need your attention, and where? And again, why? At Hyphen, we understand while talking to customers that communication is just one side of the coin, the other side is to make use of it, understand priorities, and take necessary actions when needed. Every feature of our product is designed keeping this in mind. Last month we introduced Action Planning to turn key topics into business outcomes, and this month we are releasing two new reports that blend together insights from surveys, pulse polls and real-time employee conversations - Leader View and Category View. Leader View and Category View help make cost-effective & impactful people success initiatives. Leader View is designed to give HR/Organization leaders, a bird's eye view of all activities within their organization. More importantly, it auto-prioritizes segments & categories by running algorithms on all the data, which essentially do a "needle in the haystack" analysis to identify what what should be top of mind today for you, for your management, for any manager in the company. Quickly, leaders can prioritize action items, for the next month, without even needing to look at the entire data. RCA can also be done by their teams, by digging deeper into each question & comments related to it, in the Category View. Category analysis provides a much deeper view into understanding which segments under each category are doing well/need attention. 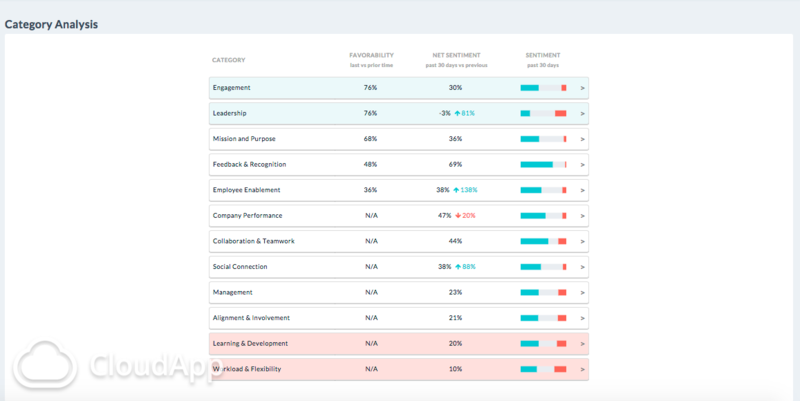 Once the top and bottom categories are identified in the Leader View, you will want to drill-down and understand what drives these categories up or down, which segments matter most, which topics are key to employees. Category View can be used to create targeted initiatives and campaigns aimed at specific segments, rather than going all-out, while Leader View can be used to identify those categories themselves. Month after month, release after release, we feel proud that we increasingly help our customers achieve the people success trifecta: Active Listening, Insights & Actions! Stay tuned for more exciting updates next month!